CMS allows webmaster or content manager to author, create, modify and update content without getting into the trouble of writing long-tail, complex HTML codes. 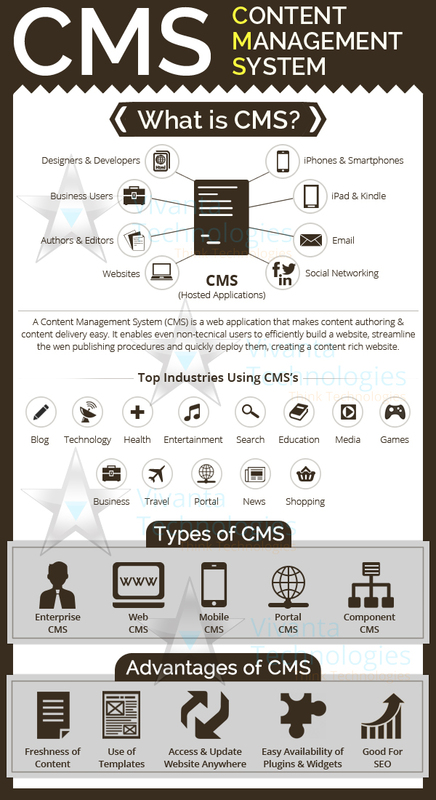 Normally, a CMS has two elements, namely - content management application (CMA) and content delivery application (CDA). Changes and modifications in content are made in CMA and the CDA then compiles content to be displayed on the webpage. The CMS offered pre-defined templates, which can be modified with your enterprise logo and theme to make it an extension of your business. There are software developing firms that can help in building content management system according to intrinsic requirements of a business or can modify an existing off-the-shelf template for faster deployment. High-end CMS can transform PDF and scanned document into HTML to be supported and displayed in web sites. For open-source CMS the source code is available to the developers to modify and customize it to suit their needs. Open-source CMS are available for free and suits needs of small and medium size businesses which don't have huge IT budget to pay licensing cost of branded CMS. They can modify the source code to give the CMS look and feel of their organization to make it an extended arm of their business. To meet advanced level requirements of some businesses some open source content management system offer a hoard of plug-ins and framework that can be incorporated in the system to add advanced level features to it. Usage of open-source CMS offer certain advantages over the traditional, proprietor software. Over the last few years usage of open-source software has grown significantly amongst business of all size since these have allowed them to cut on their IT budget. No licensing fees would mean that more fund and resource can be invested in developing feature-rich, content-rich websites. Secondly, open-source codes allow one the freedom to modify the code to suit their requirements. One normally has the freedom to manipulate pieces of codes which means the code library is constantly improved and enriched. Open-source is supported by developers' community where they upload their codes, sort problems and discuss about improvements. This means open-source software is supported and strengthened by a large community that confirms high quality and stability. Generally, error and bugs are reported immediately and get sorted by other developers. Contrary to proprietary software, which is managed and updated by the company, an open-source CMS is always updated. Finally, there is no lock in period. One can change vendor any time and upgrade service as and when need changes. The decision, however, to use open-source CMS must depend on intrinsic requirements of a business. If you have in-house IT team, which can indulge in development and management of software then open-source CMS is the way for you.